LINCOLN, Neb. — Dean Stevens knows the value of getting a bird’s-eye view of his corn and soybean fields to assess plant health, wind damage, and pest threats — problems that, in their initial stages, may be difficult to assess on a field scale from conventional scouting. Stevens, who farms near Falls City in southeast Nebraska, started aerial scouting his fields from small planes in the 1990s, taking photos to document plant health and wind damage. In the early 2000s, he got his sport pilot license and moved to a two-seater powered parachute to do aerial scouting. Flying just 30 to 100 feet above the crop allowed him to view fields more personally and evaluate stands, water needs, soil nutrition, and pest pressures, taking photos that he shared with his crop consultant. Together they used the data he gathered to address problems in the field. Now, with the support of a Farmer Rancher Grant from the North Central Region Sustainable Ag Research and Education Program (NCR-SARE), Stevens is keeping his feet planted on the ground while a drone outfitted with infrared sensors scouts his fields each week, providing key data that can be used to develop prescriptions for targeted, precise in-season nitrogen applications. A longtime advocate of on-farm research, Stevens has been conducting field trials on his farm since 1974 when he graduated from the University of Nebraska-Lincoln with a major in soil science. He has evaluated crop hybrids, fertility, population, seed treatments, fungicides and nitrogen applications. In 2016, Dean and his wife and farming partner Debra applied for and received a $15,000, two-year NCR-SARE farmer/rancher producer grant to study how to conserve nitrogen use in corn production by applying a larger amount in-season, based on crop need. The project is: assessing cutting-edge technologies for determining optimum nitrogen rates; demonstrating the efficiency of applying a higher percentage of nitrogen in-season; and using variable rate technology to apply precise nitrogen rates, based on data gathered from drone mounted sensors. This year, in the first year of the grant, the Stevens established their research study in a bottomland rainfed field of silty clay loam with some silt loam soils. They’re testing their current preplant nitrogen rate (160 lb/ac N) and two lower rates (100 and 75 lb/ac N), replicating each rate four times. By applying more nitrogen in-season, they can respond to each season’s specific conditions. For example, if early mineralization is higher than normal, the in-season N application rate can be decreased or if early season rains may have leached some nitrogen, rates can be increased. Good stewardship is also an important aspect of moving more of the nitrogen application to in-season based on plant need, Deb said, noting the practice could provide both environmental and economic benefit. To assess the effect of the different rates on plant nitrogen, a drone outfitted with infrared sensors was flown weekly over the field trials by daughter and son-in-law Laura and Nathan Thompson, both of whom have FAA remote pilot certificates. The sensor data was then coupled with two algorithms and the Hybrid-Maize models to calculate the optimal in-season nitrogen rate for each strip. “As we suspected, there was a lot of variability across the field in nitrogen need,” Stevens said. Applying fertilizer based on the infrared imagery may not necessarily mean less nitrogen is applied, but rather that what is applied is targeted to exactly how much is needed, where it’s needed, and when it’s needed, increasing nitrogen use efficiency and reducing the potential for nitrogen loss. The corn was too high for a sidedress application and Stevens worked with an aerial applicator who could make precision applications of dry urea to individual test strips. Traditionally growers might use a predetermined rate and time of application or wait until the plant’s need for nitrogen was visible, which might cost the grower potential yield, Stevens said. 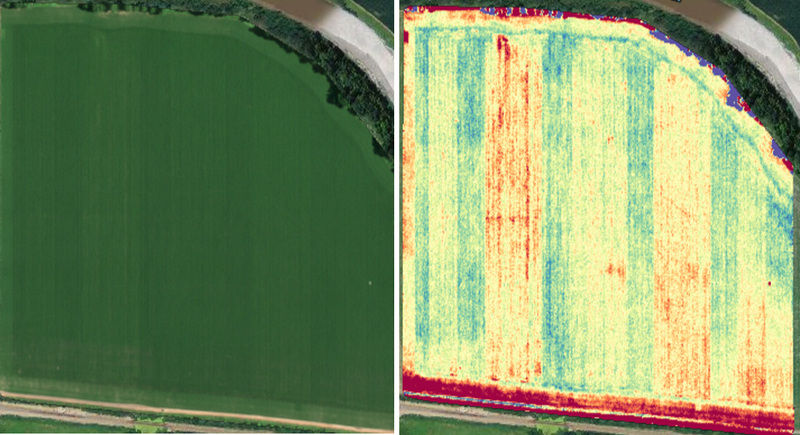 Using the infrared imagery provided by the drone flights allowed earlier detection of plant nitrogen needs so they could be addressed before yield was affected. Adopting the drone technology had its challenges, but was made easier with some “high tech children,” Stevens said. Daughter Laura, a Nebraska Extension educator for agricultural technologies, is also a coordinator for the Nebraska On-Farm Research Network, and Nathan works in agriculture. Also contributing to the project through development of educational events is Gary Lesoing, Nebraska Extension crops educator with responsibilities for Nemaha and Richardson counties. Each flight may have as many as 4,000 single photos that need to be stitched together to create a single, high-resolution image of the field, Stevens said. This compilation is done in the digital cloud by a commercial firm specializing in agricultural uses of drone imagery. Flights also aren’t necessarily a one-person job. Drone pilots are required by the FAA to keep their eye on the drone at all times, while also piloting the drone from a screen, Deb said. While the drone flies a pre-set pattern to criss-cross the field, it can still be helpful to have a two-person crew. “When you’re flying a drone at 300 feet in the summertime, you have to keep an eye and an ear toward sprayer planes,” Dean said. There were several flights where they maneuvered their drone to the ground as a sprayer plane moved from one neighbor’s field to another, crossing their flight path. Next summer, during the second year of the grant, the research will continue on the Stevens farm and be initiated on Dale and Ronda Yoesel’s neighboring crop and dairy farm, allowing the on-farm researchers to collect data from two different fields with similar research protocols and management. Results from the first year of the project will be shared this winter when the Nebraska On-Farm Research Network hosts meetings to report data gathered and lessons learned by participants in 2017. In summer 2018, the Stevens will share further information about this project at a field day.